Would you like to capture leads even when users don’t finish your forms? 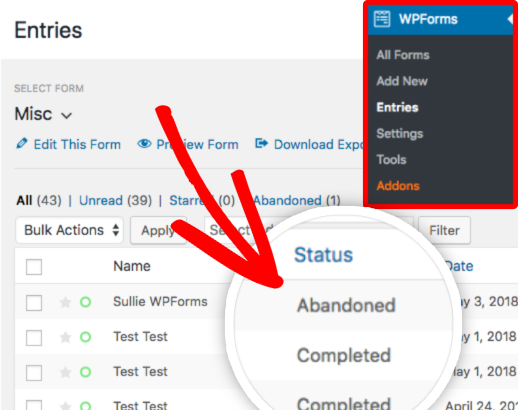 With the Form Abandonment addon for WPForms, you can easily collect partial entries for your forms, gathering data even if the user abandons the form partway through. In this tutorial, we’ll show you how to set up and use the Form Abandonment addon for WPForms. Requirements: You will need a Pro license level or higher to access the Form Abandonment addon. A form is considered “abandoned” when a user stops filling it out partway through. In some cases the user may only complete a single field, while in others they may complete most or even all of the form without clicking the submit button. However, the Form Abandonment addon can capture entries no matter how far the user gets in the form. Note: To learn about common reasons users abandon forms, and how to address them, please check out our article on fixing low converting forms. Once the core WPForms plugin is in place and your license is verified, you’ll be able to quickly install and activate the Form Abandonment addon. Now that you have the Form Abandonment installed and activated, you’ll need to create a new form or edit an existing form. While your form can include any fields you’d like, we recommend that you ask for the user’s name, as well as their email address and/or phone number, at the beginning of your form. This way, you can follow up with the user even if they only complete the first few fields. Next, you’ll need to enable Form Abandonment in your form’s settings. To do this, open the form builder and go to Settings » Form Abandonment. From here, you can check the box labeled Enable form abandonment lead capture. Once form abandonment is enabled, some additional options will appear. Save only if email address or phone number is provided: Recommended in most cases, since this will provide you with the minimum information needed to follow up on the lead. Always save abandoned entries: Use this option only if you want every single partial entry to be saved. Best for anonymous submissions, such as an anonymous survey or poll. Next, you can choose whether to enable the Prevent duplicate abandon entries option. By default, WPForms will save all partial entries even if the same user fills out your form multiple times. When this box is checked, you will be able to avoid collecting multiple entries for a single user. For example, a user might start filling out your form, abandon it after filling out the first few fields, and then return later and start filling it out again. By default, both of those entries will be saved. For most sites, we recommend enabling this option to avoid collecting the same information multiple times. Once you’ve set up form abandonment, you’ll start seeing abandoned entries recorded on your form’s Entries page. To test this out, you can try starting and then purposefully abandoning your form. Then, you’ll need to go to WPForms » Entries. From here, be sure to select the name of the form you’d like to see entries for. If Form Abandonment has been enabled for the form you select, you’ll see a Status column. Within this column, entries will be labeled Abandoned when applicable. 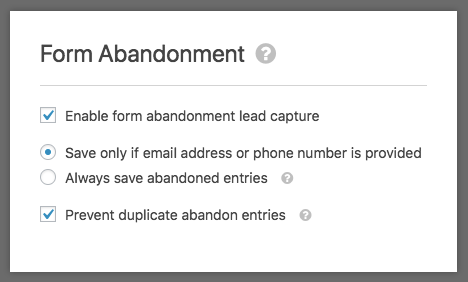 In addition to saving abandoned entries to your site, you can choose to send out automatic notification emails when a form has been abandoned. This can allow you to quickly follow up with a potential lead. However, you can send out as many emails as you’d like when a form is abandoned. For example, you could automatically send an email to the user who abandoned the form. 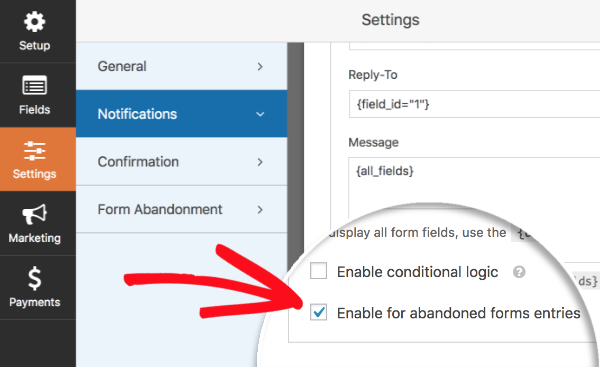 To set up an abandoned form email, you’ll need to open the form builder and go to Settings » Notifications. Then, scroll to the bottom of the notification settings. From here, you’ll be able to check the box labeled Enable for abandoned forms entries. Note: If setting up abandoned form emails, don’t forget to also set up separate emails for completed forms. For details, please see our tutorial on setting up multiple notification emails. That’s it! You can now collect entry data even when a user abandons your form. Next, would you like to add custom branding to your emails? Be sure to check out our form notification tutorial for details on how to customize the background color of emails and add a header logo. Fixed: Conflict with email notifications configured with conditional logic causing notifications to send when they should not. Fixed: Incorrect version in updater which caused WordPress to think an update was available.